The weekend is upon us again, and I hacked off with the weather, again! We are predicted snow yet again, ok it was fun for a few days but not any more. The country grinds to a halt and the food goes up in price. It never goes down in the summer though, funny that. Petrol goes up, the oil companies make billions and the complain they are hard up, yeah right. Enough off me being grumpy, I can’t roll it out of the garage if it snows or rains, but on the other hand, I can work in the garage out of the rain. It just goes to show how spoilt you can get in any situation. A couple of months ago I had to stand out in the rain to do anything on the car, now I can stand in the dry and do it, and I moan again. I’m lucky I have somewhere to put my car and I must keep that in mind. I am luckier than a lot of others, I own a classic Mustang and it’s in my garage. What do I do this weekend? It’s to cold to spray anything again, unless we have a major breakthrough of sun, according to my weather apps that is just not gonna happen. I may do a bit on my blog if its to bad, and catch up on a review or two. I do need to get my brakes drums off and measure the shoes, this is holding me up to get things moving. Once these are a confirmed size I will order them and get them fitted along with the I hope to use my new tools and see if they do make the job easier. I feel a review coming on for these tools what ever happens. 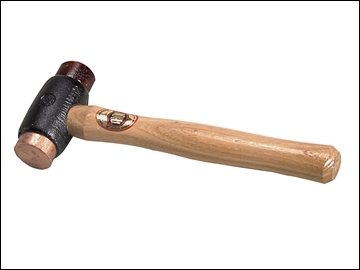 Speaking of tools, I ordered a copper hammer with first class post delivery from eBay, that was on Tuesday this week. Guess what? It ain’t turned up, and this man is not amused. I do suspect that Monday some poor person is going to have a bad morning once they pick the phone up if it’s not delivered tomorrow. If we don’t complain to these people they get complacent, and it becomes the norm. I’m looking forward to the weekend itself, it’s just a shame its not nicer weather. Frost Auto Restoration Techniques have put a link to my Dinitrol 6030 review. I’m well pleased with that of course, hopefully it will expand my visitors and followers too. This entry was posted in Car, General, Reviews and tagged blog, brake booster, brakes, Frost, garage, grumpy, petrol, snow, spray, weather. Bookmark the permalink. When Owl and I moved in together last summer we had two homes to bring together. He happened to be rushed into hospital between having the removal men in and the house clearance in. His instructions from his hospital bed were that only the half dozen items he listed were to be kept and everything else in the garage could go. Obviously since then he has been wishing he had gone through the garage thoroughly before hand. I have lost count of the times he has regretted the loss of the socket set that has been with him man and boy. Other missing items have been rued along the way but last night he added the loss of his trolley jack. I am sure as the months/years progress there will be more tools he will regret losing because he left me in charge. I only followed his instructions!